A handcrafted science necklace is a striking way to make a subtle statement. Molecules star in these chemistry-inspired pieces created by a science teacher. Each bears a scientifically accurate—and lovely-looking—compound in stainless steel. It’s a slyly personal piece with meaning explained in an included card. Give one as a dose of something needed or to showcase a love of all things science. Made in the USA. Dimensions: Adrenaline: 1.5" x 1" x 0.02"; Serotonin: 1" x 1" x 0.02"; Dopamine: 1.25" x 0.6"x 0.02"; Oxytocin: 3.25" x 1.75" x 0.02"; Estrogen: 1.75" x 0.75" x 0.02"; Benzene: 0.5" x 0.5" x 0.02"
Adrenaline: Also called adrenalin or epinephrine. Secreted by the adrenal gland in your body, this hormone gives you that rush on a roller coaster and the fear you feel while watching a horror movie. In the hospital, adrenaline is used to treat anaphylaxis and cardiac arrest. It's the medication found inside epinephrine autoinjectors to save lives during extreme allergic reactions. Gift for people with peanut and sting allergies as a constant reminder for vigilance. Serotonin: Serotonin functions as a neurotransmitter in your brain that, along with dopamine, is associated with feelings of happiness. A serotonin release causes you to feel more generally happy. An absence of serotonin can cause feelings of depression. Dopamine: Dopamine functions as a neurotransmitter in your brain that, along with serotonin, is associated with feelings of happiness. Dopamine is what causes you to feel really good when something goes better than you had expected. An absence of dopamine can cause feelings of anxiety. Oxytocin: Oxytocin is the love and bonding hormone. It's the hormone released after birth to help new moms bond with their baby. It also induces milk production. It's not just for new mothers though. Oxytocin is what you feel whenever you hug someone you love. Recent studies have even proved that oxytocin is released when you interact with your pets as well. Estrogen: Molecular structure of estradiol, one of the estrogen hormones used in your body. Benzene: One of the most fundamental structures in organic chemistry and can be found in most organic molecules. The hexagonal honeycomb shape of the six carbon atom chain also represents one of the strongest and most space-efficient engineering structures which is why it appears so frequently in nature. A perfect gift for the organic chemist, architect, beekeeper, honey farmer, apiarist, apiculturist, or minimalist in your life. Making science jewelry is a no-brainer for Carrie Parker. She’s the science teacher child of a science teacher and a chemist. As a way to get creative outside the classroom, Carrie began crafting molecule necklaces in her spare time. Her beautiful pieces are made with a passion for all things science with the goal of spreading the science-y love. 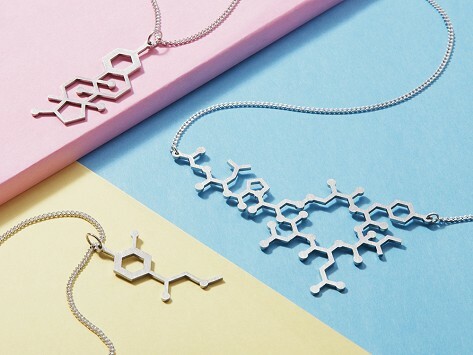 Carrie handcrafts each scientifically-accurate stainless steel pendant in Pittsburgh, Pennsylvania, and pays tribute to some of the feel-good molecules found in our bodies like serotonin, dopamine, and oxytocin. For the non-chemists out there, she includes information about each one. The necklaces have a minimal feel that’s also striking. One makes for a gift with subtly personalized meaning or as a unique statement you can make for yourself.